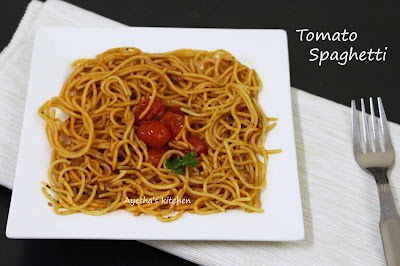 Am back with a very simple but finger licking recipe for spaghetti. Spaghetti is a long, thin, solid pasta - a staple food of traditional Italian cuisine. Spaghetti is the perfect dish for starters in cooking and can experiment with it without any fail. We can find lots of simple pasta recipes which can turn your dinner more delectable. Some pasta dinner recipes can have on the table even within minutes. All you need is a pack of spaghetti, sauces, seasonings, cheese and sometimes eggs or chicken or veggies. Pasta for kids is something more colorful, cheesy and creamy. Right? Yes, we moms often surprise our kids with attractive pasta meals. Just make pasta sauce at home for your family instead of store bought one. Healthy spaghetti recipe with simple spaghetti sauce is the one which I searched for on weekends. Some like spaghetti to be creamy, some like it tangy, some needs their spaghetti the best of all. This recipe of tomato spagetti with simple tomato pasta sauce is a perfect for all. You can also try the same recipe with basil tomato sauce too. Here I made this spaghetti with a quick pasta sauce that too, tastes yum. As I couldn't have enough time to make tomato sauce from fresh tomatoes, I substitute it with store bought. 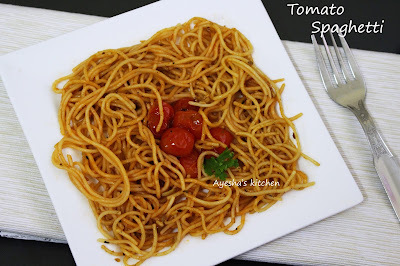 Hope you all will surely try this easy yummy pasta recipes. Here is the recipe showing how to make spaghetti with your own pasta sauce / vegetarian pasta recipes/pasta dishes for kids. Enjoy!! Red chili powder - half tsp (can use red chili flakes), can add less for kids. Cook spaghetti in salted boiling water for 7 minutes or 90 % done. Or cook as per the instructions are given on it. No need of stirring in between and do not cut the spaghetti. When done drain the excess water and set aside. Meanwhile, combine together all the ingredients given under FOR PASTA SAUCE in a bowl along with a tbsp water. Give a fine mix. Set aside. Now heat a pan with butter or olive oil. Saute the halved cherry tomatoes for a minute and transfer it to plate. Add chopped garlic and saute on a very low flame for a minute. To this, pour the prepared sauce mixture and combine well. Cook until the sauce thickens and then add the cooked spaghetti to it along with stir-fried cherry tomatoes and mix well for a minute. Remove from flame and serve hot. Yum Yum.